Drinking remains the number one cause of accidents and deaths from impaired driving. However, an increasing number of drivers are testing positive for marijuana. Here are the latest reports on this growing public safety concern. This law will have a sweeping and significant impact on individuals and businesses - employers and employees, real estate owners and landlords, financial institutions, businesses and business owners, healthcare providers, insurance providers, and potential investors, to name but a few. As Ohio follows the national trend and joins the growing number of states legalizing "medical marijuana," numerous legal issues will undoubtedly arise. Elizabeth Kemble, a widely admired advocate for kidney health in Oregon, was out for a walk following her third kidney transplant when she was killed by a driver who admitted to smoking marijuana minutes earlier. Debra Majkut, an Ohio mother of two, was sitting on her couch with her children and a nephew when a woman high on pot crashed into Majkut’s home, killing her and seriously injuring her infant son. 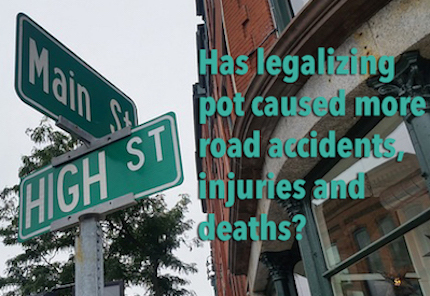 Nightmare scenarios like these are exactly what safety advocates predict will become commonplace on our nation’s roads as the list of states legalizing marijuana for either recreational or medicinal use continues to grow. But instead of clearing the smoke, conflicting studies and a patchwork of state laws have complicated this issue for all of us concerned about impaired driving. The number of drivers with marijuana in their systems grew nearly 50 percent from 2007 to 2014, according to a national roadside survey. A recent study of high school seniors showed that one in eight admitted to using marijuana before driving. Katie Couric walks us through the change of mindset and laws surrounding the legalization of marijuana. A new, first-of-its-kind driving simulator is helping researchers study the effects of marijuana use on driving. View video. According to a new AAA study, fatal crashes involving a driver who recently used marijuana nearly doubled in the year since legalization in Washington state. View video. Statistics show that the percentage of intoxicated motorcycle riders in fatal crashes is greater than the percentage of intoxicated drivers on U.S. roads. Next month: motorcycle safety. An NPR investigation finds that more drivers are using marijuana, but experts can’t agree on what that means for traffic safety.